Many of us will go to great lengths to keep our hair on point. But could some of your every-day habits ― like washing and styling ― actually be hurting you? Here, we separate follicular fact from fiction. 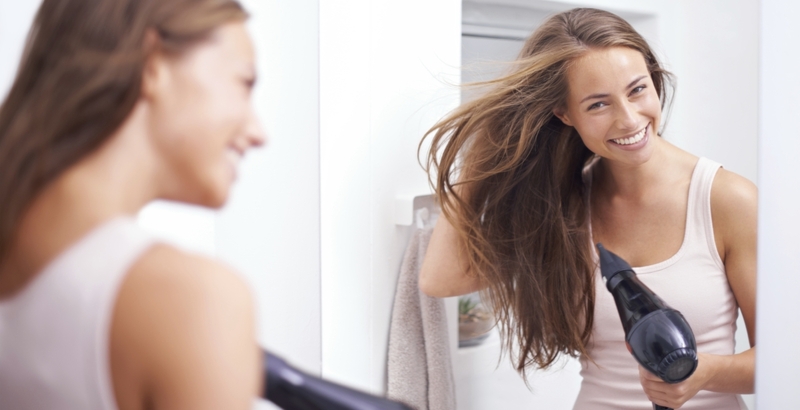 Truth: One study revealed that while blow-drying hair causes more damage to the hair’s surface, air-drying hair can cause damage within the strands themselves. When your hair is exposed to water for extended periods of time (let’s say, the hour it takes for your hair to dry on its own), it swells up and puts pressure on the proteins that keep your hair intact. Your best bet? Air-dry until hair is about 75 percent of the way there. Then, put your dryer on a low heat setting and dry the rest of your hair to finish. Truth: Actually, it’s the opposite. Dandruff is most commonly caused by a type of yeast that thrives in… an oily environment. So if you’re worried that washing your hair every day will be too drying and cause more flakes, go pick up a medicated shampoo and wash it. Like now. Truth: Hair growth happens at the scalp. That said, the frequency of trims has nothing to do with how fast (or slow) your hair will sprout. The reason why you’ve heard this tip so much is because regular trims prevent split ends and breakage ― the nemeses of anyone who is trying to go long. Ask your stylist for a light dusting every eight to 12 weeks to keep the overall look healthy. Truth: Graying is mostly determined by genetics and aging. As you age, you produce less melanin (the molecules responsible for your natural color). This causes new hair to come in gray (with minimal melanin) or white (with no melanin). As for stress ― what you’re actually experiencing is a quickening of fallout. Then, yes, if you’re of a certain age, it will then grow back in gray. Truth: A loose ponytail or chignon is fine. But, yes, a constant stream of tightly woven braids, ponytails and top knots can be damaging because it creates tension on your hair follicles and can lead to permanent loss. (This applies to prolonged wear of extensions as well.) You can wear your hair up ― just maybe go easy on the rubber bands. Truth: Stylists often finish washing your hair with ice-cold water because it's supposed to close your hair cuticle so it lies flat (and thus, reflects light). However, your hair contains no living cells. Therefore, it doesn’t react to cold (or hot) water. If smoother, shinier strands are what you’re after, invest in a good conditioner instead. Truth: Sure, brushing can distribute your natural oils, but more is not always best. In fact, too much brushing can create friction, which causes frizz in the short term and can lead to breakage over time. Brush only as needed and gently, starting at the bottom and working your way up to the root… slowly. Truth: Different shampoos deliver different results. One might have proteins in it to give you extra volume; another may have jojoba oil to hydrate parched strands. Switching shampoo comes down to personal preference ― and your hair’s current state. For example, is it newly bleached? If so, you might want to swap your standby for a more moisturizing formula. Otherwise, they work the same as they always have. This article was written by PureWow from Huffington Post and was legally licensed through the NewsCred publisher network. It is not endorsed or sponsored by John Frieda. Please direct all licensing questions to legal@newscred.com.